In the aftermath of 9/11, the United States and its NATO allies invaded Afghanistan in order to dismantle the Taliban regime and the core leadership of al Qaeda. After several weeks of conflict, NATO troops successfully ousted the Taliban from various cities and helped to establish a new democratic country — the Islamic Republic of Afghanistan. As a result, the Taliban regime remains a bitter memory for most Afghans, who never want to see them come to power again. The Taliban regime is a dark period of our country’s history. During the Taliban regime our people had no hope to live. For, had they anything, it was either burned or destroyed […] The Taliban regime was a dark period that any Afghan citizen would never forget. And while many Afghans suffered during the Taliban regime in various ways, it was females who suffered the most. During the Taliban regime we were compelled to stay at home. [We] couldn’t work outdoors. If we went outside we had to wear a burka. As a Muslim woman before the Taliban regime I still wore a veil and followed Islamic rules regarding the hijab, however, during the Taliban if we didn’t wear a burka we were whipped […] We have an ill-fated memory of the Taliban. [They] increased the miseries of our people and we don’t want them to come to power ever again. A recent report by The International Crisis Group (ICG) warned that the Afghan government could collapse after the troop withdrawal. And some also predict ethnic clashes in the country. Our nation was not born in 2002. We have a history of 5,000 years. We have fought against superpowers in the past. Our national police and army are ready to defend the country’s soul and sovereignty. Reports over Reports predicting Afghanistan’s descent into chaos. Why are the experts so excitingly promoting & predicting failure?? 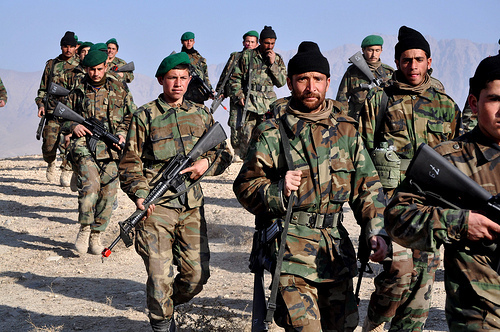 Is the US-Afghan Strategic Partnership in the Doldrums?